While rising African debt levels occupy headlines1, we sift fact from fiction below, and discuss how we evaluate opportunities. Read more by downloading the full Viewpoint here. Are we close to a tipping point? Following a sharp rise in indebtedness in the 1990s, the early part of the 2000’s was a period of debt consolidation and write-offs in Africa as a result of the Heavily Indebted Poor Countries (HIPC)2 programme and its replacement, the Multilateral Debt Relief Initiative (MDRI)3. After a sustained period of consolidation, with median debt to GDP hitting a low of 38.1% in 2008, the exponential rise in commodity prices helped stimulate growth and investment into Africa. African governments borrowed in international markets to support investment expenditure – but as deficits worsened, risk rose. As oil prices collapsed from June 2014, accompanied by rising borrowing costs, balance sheets deteriorated. However, re-leveraging across Africa and other frontier markets (Chart 1 below) hasn’t been at the expense of debt balances, given growth. The African region is expected to deleverage from now until 2022, reflecting stabilisation in commodity prices, improvement in global growth and economic reforms that were implemented during the crisis. While the build-up of African debt balances is a risk, balance sheets should stabilise below distressed levels, providing the external environment remains stable. With 54 countries across the region, we recognise that Africa represents a diverse investment universe; real value can be added by understanding divergences within Africa, and acting on these insights through active country allocations. So how do we differentiate? Looking across the African continent we can split our economies into four broad categories. Currently Ghana, Egypt, Gabon, Nigeria, Morocco and Zambia (and to a lesser extent Tunisia) are undertaking aggressive fiscal reform programmes, often supported by the IMF and other multilateral lenders. Countries such as the Ivory Coast, Rwanda, Namibia and Uganda have all seen some widening in fiscal and current account deficits but these remain at manageable levels. 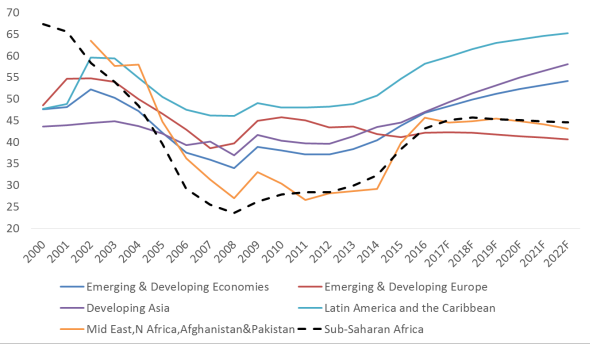 Betting on Growth - These countries have seen debt levels rise on the back of increased infrastructure expenditure, which will require a sharp pick-up in economic growth to be sustainable, otherwise deficits will need to be cut faster than planned. Too much of a good thing often has consequences, and that’s why in countries such as Kenya and Ethiopia we remain cautious and we avoid investment here. Angola and Mozambique are among those we continue to avoid as we are yet to see sufficient progress on economic reform needed to sustainably lower debt levels. Increased fiscal consolidation and progress negotiations with multilateral partners, such as the IMF, must happen before we consider investment. The dispersion of economic fortunes across Africa represents opportunity for the discriminating. We continue to favour reforming countries and reflect this in the portfolio through positions in Egypt, Nigeria, Morocco and Zambia, where permitted. We also selectively allocate to countries such as the Ivory Coast and Uganda given their manageable debt metrics and attractive growth rates. Looking beyond the negative headlines, the period ahead still looks promising and we will continue to keep you updated on interesting trends across the continent. 1 Most prominently through the Financial Times’ article titled ‘African debt worries intensify as levels near tipping point’ (click here). 2 Is a group of 39 developing countries (33 of which are in Africa) which qualify for debt relief and low interest rate loans from the IMF and World Bank, where debts are considered unsustainable (defined as debt to exports>200-250% or when debt to government revenues exceeded 280%). Initially launched in 1996 it has provided full or partial debt relief to 36 countries. 3 Implemented in 2005 the MDRI was intended to supplement HIPC by providing debt relief to low income countries in attempt to support countries in meeting the Millennium Development Goal of halving poverty by 2015. Although similar, the MDRI differed from HIPC because it did not propose any parallel debt relief on the part of official bilateral or private creditors, or of multilateral institutions beyond the IMF, the International Development Association (IDA) of the World Bank, and the African Development Fund (AfDF). Issued by Investec Asset Management, issued December 2017.